Now it is official. The 2012 London Olympics will NOT be green. Just the same old corporate brownfield concrete Olympics as before. 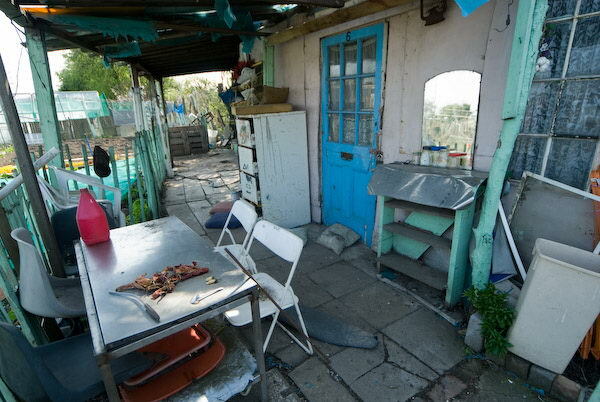 London 2012 was offered a chance by the Manor Gardens Allotments and it has now finally turned it down. A chance to do something fresh and exciting, to incorporate a green centre into the Olympic site. But from the beginning it was obviously a long shot, something that the kind of large scale business-led planning couldn’t begin to appreciate. I don’t attach any blame to Manor Gardens. They’ve put up a great fight, but with the provision of the Marsh Lane site they’ve obviously lost their major battle. The revised proposals for the site, including the removal and replacement of 880mm (almost 3 feet) of topsoil and the provision of 64 plots, each with its own shed, as well as a communal hut, should mean that allotment holders are back in business later this year, and the impact on the Marsh Lane site has also been slightly lessened. They are also to be allowed limited access to their existing plots to harvest their crops until September, and cash compensation, apparently of £850 each, for the disturbance as well as help with the removal. So there have been some fairly important gains from the plot-holders point of view. There is also a promise to relocate the plots back onto a new site within the Olympic area in 2014, although not on their current site, which I think is more likely to become a prestige housing development. What we all have lost is an exciting Green vision of garden plots at the centre of the Olympic site. It will now just be the usual boring concrete acres with probably a giant corporate sponsored scoreboard where the allotments were. A desert with no real food – just fast junk from corporate sponsors, and you will be searched as you enter to make sure you bring nothing with you that doesn’t bear the correct sponsor’s logo. taken in 2005. It isn’t an idyllic rural scene, but is an important area of open space, and one that has been vested in the people in perpetuity. I’ve made several visits to Manor Gardens Allotments. I was at the ‘New Year Feast’ which included the Hackney Wick Olympic Flame, and in March I went for a meeting with the Olympics Delivery Authority, who pulled out at the last minute, and went on to visit the allotments again, and in April I was there for the Spring Party. and visually it is very rich. No two sheds are the same, each carrying the traces of present and past owners. No two plots are the same. You can’t really manage history, or at least not in the way that we try to do at the moment – and there is plenty of this attempted in the planning submission. In a way its like gardening. All you can do is plant things and give them the right conditions in which to grow. It isn’t matter of ticking boxes, meeting this and that requirement, detailed plans etc. Those give you something sanitised and lacking in interest. I’m sad. Sad that as a nation we’ve lost vision, lost flair. Gained regulation, uniformity. No room for people like Major Villiers who endowed the Manor Gardens plots. At the bottom of the lack of vision in Olympic planning is fear. Or, as they might call it, security. From July 2 the Olympic site will be a total no-go area, with all roads and footpaths closed. The allotments couldn’t stay because they are scared that gardeners will bring in bombs with their gardening tools! 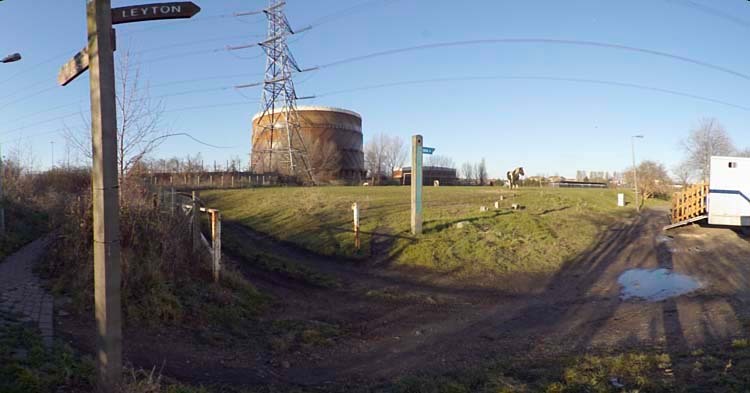 Eastway and Ruckholt Road will continue to go through the site, possibly too the Greenway and Lea Navigation towpath, though these are subject to closures on the developers whim. If you want to see the Lower Lea before its destruction (aka regeneration) you only have a few days left before the lock-down. 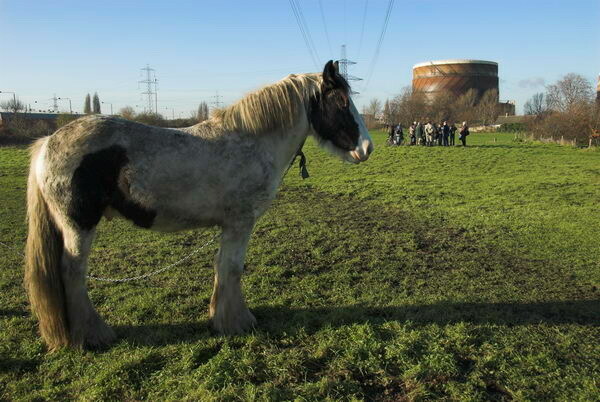 You can see quite a few images from around 1980 to the present on my unfinished River Lea site and also, particularly more recent work on My London Diary; most of my visits to the Olympic site are listed under Newham, although some parts are in Hackney, and small areas in Tower Hamlets and Waltham Forest. This entry was posted on Thursday, June 14th, 2007 at 08:50 pm and is filed under My Own Work, Political Issues. You can follow any responses to this entry through the RSS 2.0 feed. You can leave a response, or trackback from your own site.